MDG architects has specified a translucent glazing system from Kalwall for the UK’s largest Cooper BMW showroom, which has recently opened in Reading. 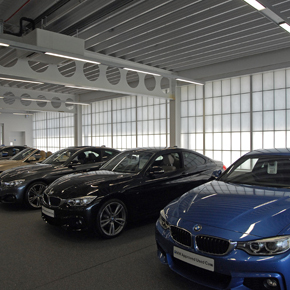 The 13,000 square metre, three storey building showcases over 100 new and approved used cars, making a major relocation for Cooper BMW from its previous smaller site into a state of the art new facility. MDG architects chose to specify the Kalwall translucent glazing system fro the elevation and main entrance canopy to complement the displays. Supplied and installed by Structura UK, the translucent system helps to diffuse natural daylight deep into the interior, creating a well-lit and aesthetically pleasing ambience. At night, the elevation emits an attractive exterior glow. Kalwall glazing is designed to eliminate shadows, glare and the stark contrasts of light and shade. This removes the need for blinds, curtains and solar control. As the system floods the building with natural daylight, less artificial lighting and heating are required, reducing energy costs.